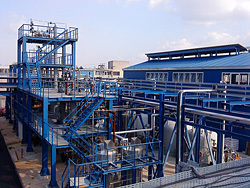 KAPACHIM GREECE has installed a film reactor sulphonation plant in the area of Inofita, which is located 60km north of Athens. It is producing a range of Sodium Alcohol Ethoxy Sulphates with annual capacity of 18000 tons/year, and a range of Linear Alkyl Benzene Sulphonic Acids with annual capacity of 15000 tons/year. KAPACHIM GREECE is also operating a multi-purpose manufacturing facility mainly for the production of Alkyl Betaines, Alkyl Amides and other specialty products. Our annual capacity is 5000mt per year for each of the above mentioned products. Since 2009, we have started a new chlor-alkali plant with annual capacity of 4000tons of Chlorine, mainly used for the production of Sodium Hypochlorite. This new investment incorporates the latest membrane electrolysis technology. Except being a key supplier to most multinational and local detergents and cosmetics manufacturers, KAPACHIM GREECE has also a vast and continuous export activity in the surrounding region. Our range of products find application mainly in the manufacture of : DETERGENTS, COSMETICS, CLEANERS, DRILLING AIDS, INSULATING-CONSTRUCTION CHEMICALS, WATER TREATMENT, TEXTILE.